This set consists of open numbers as used on German Tanks . 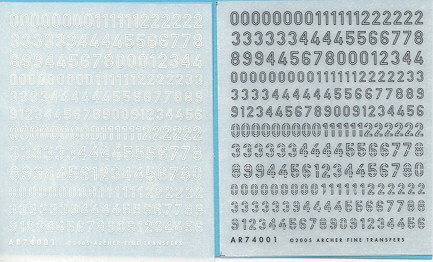 These two sheets are for white and black numbers in both stencil and non-stencil types and fit either 1/72 or 1/76 subjects. There are two sizes of each and more than enough to do just about any combination you might need. These are dry transfers and so can be put directly onto a finish without any previous preparation. For those who may wish, you can also place these on clear decal sheet and then use them like a standard water-slide decal. It is nice to see Archer expanding their line of small scale transfers.